Captain is a pony presented for possible pain as an underlying cause of behavior issues that have improved with acupuncture in addition to an intensive training schedule. 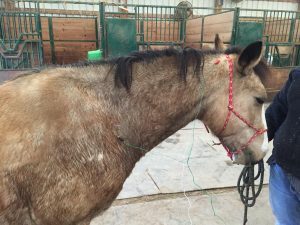 Captain is an 11-year-old buckskin and white Chincoteague Pony gelding presented for possible neck pain and behavior issues. He has been used as a hunter/jumper for the past 2 years. About 1 year ago he experienced a mild traumatic event in the barn. 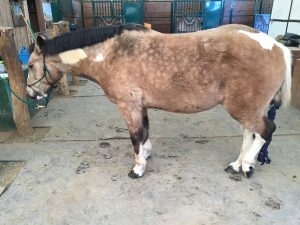 Since that time, he has developed behavior problems that have progressed recently, leaving the owner unable to ride him. Captain spooks and runs when ridden outside, and spooks to a lesser extent when ridden inside. He is difficult to work to the left at all gaits and continually breaks from the canter on the left lead. Captain was evaluated by a veterinary chiropractor on 10/17/17 where it was determined that he had malalignments in his cervical vertebrae at C2, C3, and C5 that were adjusted that day. Captain has been placed in a natural horsemanship training program due to his owner’s inability to ride him safely. Physical and ocular exams were within normal limits. No overt lameness was noted in hand or under saddle. Neurological exam showed minor conscious proprioceptive deficits during tight circling and the patient would retain abnormal placement of both pelvic limbs. Suspect grade 0- 1/5 ataxia. Motion palpation exam shows reluctance to bend neck laterally to the left at first, but eventually is willing to display full range of motion in both directions. He had decreased range of motion caudally in the left shoulder. Patient is very heavy to pick up right pelvic limb and decreased abduction of hips bilaterally. On palpation, Captain consistently shows discomfort in the left shoulder (supraspinatus m., triceps m.), left gluteals, left semitendinosus muscle, and along cranial lumbar spine. No other blood work or imaging has been performed. Patient has had regular preventive care including biannual vaccines and annual teeth floating. No history or orthopedic injections. Patient is not currently on any medications. Captain’s treatment was focused on stimulating his central nervous system to reduce inflammation and pain in his cervical spine. Electrical stimulation at a low frequency (2Hz) was used to stimulate dorsal roots in his cervical spine for reduction of inflammation and inhibition of neuropathic pain. Cervical points were also intended to promote axon regrowth and aide with myofascial pain. Points on the hip and pelvic limb were used to stimulate mechanoreceptors in peripheral nerves, including: sciatic nerve, caudal gluteal nerve, tibial nerve, and femoral nerve, to improve conscious proprioception in the pelvic limbs. Points along the semitendinosus muscle were used to decrease myofascial restriction in the left pelvic limb. When necessary, points in the triceps and thoracic limb were used to relax compensatory muscle strain patterns. Additionally, points such as GV14, Bai Hui, LI 16, and GB 21 were used each time to influence the central nervous system, as well as increase parasympathetic tone and cause relaxation and calming. c. Early fibrotic myopathy left semimembranosus/semitendinosus mm. Captain’s ataxia is minor, non-progressive, and the remainder of his physical exam was normal. The recent finding of ataxia with no other symptoms and lack of progression suggests a recent trauma as opposed to an infectious cause for neurological symptoms. The stiffness noted in the hindlimbs can be secondary to trauma causing muscle strain in semitendinosus and superficial and middle gluteal muscles. A traumatic injury, as occurred 1 year ago, fits with his chronic symptoms and lack of progression of signs. However, cervical and pelvic radiographs would be needed to definitively rule out other causes of mild ataxia or soreness in the pelvic limbs. Captain was treated once a week for 3 weeks. At initial assessment, only dry needling was performed, and the focus has been on his neck, left pelvic limb, and any other trigger points present at exam. First treatment: All points placed bilaterally if not on midline with 0.25mm x 30 mm Serin needles. Bai Hui, BL 26, BL 27, LI 16, GB 21, BL 10- used to stimulate the CNS and to increase parasympathetic tone (calming) ST 7- trigger points in masseter muscles bilaterally BL 25, BL 54, and GB 29- used bilaterally for suspect hip pain. sacral pain BL, 54, GB 29, GB 30, SP 6, BL 40- points placed bilaterally for possible hip pain and stimulation femoral, sciatic, and tibial nerve BL 10, GB 21, LI 16, BL 11, – all placed bilaterally to decrease pain and inflammation in the cervical spine. E-stim: BL 10- LI 16 bilaterally at 2 Hz for 10 minutes with an ITO unit. Third treatment: Tension was noted in left suprascapular mm., cranial lumbar spine, left superficial and middle gluteal mm. and left semitendinosus m. Needles used included: 0.25mm x 30 mm Serin needles and 0.20 mm x 25 mm Hwato needles Bai Hui, GV 14- placed for increase parasympathetic tone (calming) SI 12- placed on left side for treatment of trigger point in supraspinatus muscle. BL 25, BL 28, BL 29, BL 54, GB 29, BG 30, BL 37, BL 39, BL 40- placed on left side only for lumbosacral pain, peripheral nerve stimulation, and myofascial pain along the semitendinosus m. Ting points: ST 45 and GB 44 placed in left pelvic limb for additional peripheral nerve stimulation. BL 10, GB 20, GB 21, and LI 16 – placed bilaterally for decreased pain and inflammation in cervical spine. E-stim: BL 10- LI 16 bilaterally at 2 Hz for 5 minutes with an ITO unit. Captain showed a lot of improvement with each treatment. His behavior improved, and he was less spooky. However, this is not a controlled study and it is unclear if his behavior change is due to acupuncture treatment of continued behavior training. It was apparent to the owner and trainer that his demeanor was improved with the treatments. On each assessment muscle soreness was noted predominantly on the left side and therefore treatment was targeted to this area. On re-evaluation after 3 weekly treatments, Captain showed dramatic improvement in his conscious proprioception in his pelvic limbs with only continued abnormal foot placement of the right hind that was repeatable. His movement in a tight circle was much calmer and his foot placement more deliberate. Range of motion in his neck appeared more comfortable, but there was some mild continued delay in lateral motion to the left. His owner is very happy with his progress and since has been able to be ridden consistently outside. He will continue to be treated every other week for the next few months.